The 2nd annual Operation Jack Marathon & Half Marathon will be held on December 26, 2011. The race starts & finishes on the northern edge of Manhattan Beach. 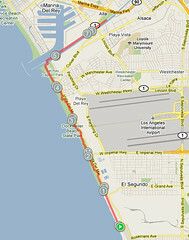 Runners will head north along the bike path through Dockweiler Beach, passing underneath the LAX flight path. 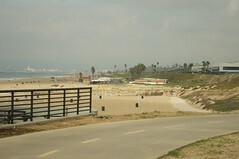 The course approaches Marina del Rey then heads east along the Ballona Creek bike path until the 6.5 mile mark. At that point, runners will return along the same route. Half marathoners finish after one lap, while marathoners will head back out to complete the second half of the race. The first Operation Jack Marathon was the 61st and final marathon Sam Felsenfeld ran for Operation Jack, raising almost $20,000. Operation Jack is an endeavor Sam took on in honor of his 8-year-old son, Jack, who is severely autistic. He ran 61 marathons in 2010 to raise money and awareness for Train 4 Autism, a non-profit that helps people raise money for the local autism-related charity of their choice. Nobody is employed by Train 4 Autism; all work is done by volunteer parents. Please join us for the marathon & half marathon as a runner, walker, volunteer or supporter. You can read more race details, including information about satellite runs, on the official race website. If you’d like to donate, CORE will be matching the first $5 of every contribution on this fund raising page. All proceeds from the Operation Jack Marathon will go to Train 4 Autism. Thank you for your support and participation!